For this holiday event, the player must placate the Romantic Acorn, the Playful Mushroom, and the Forest Guard over and over again. Players can earn prizes every time they placate a certain amount of these creatures while the event is going on. 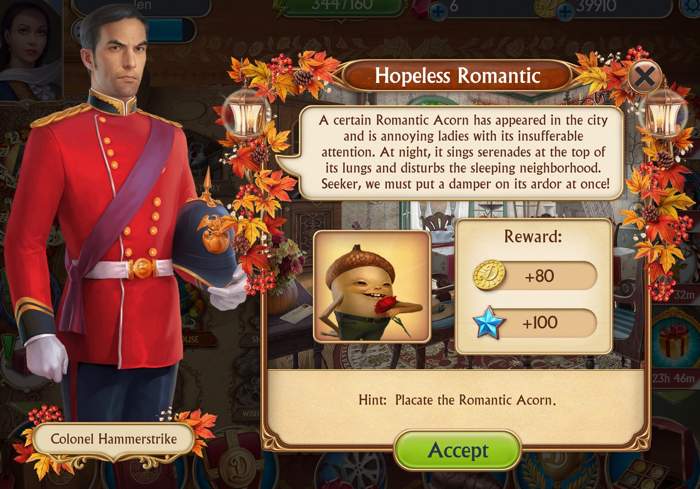 Colonel Hammerstrike: A certain Romantic Acorn has appeared in the city and is annoying ladies with its insufferable attention. At night, it sings serenades at the top of its lungs and disturbs the sleeping neighborhood. Seeker, we must put a damper on its ardor at once! Placating (or otherwise getting rid of a creature) requires specific items. 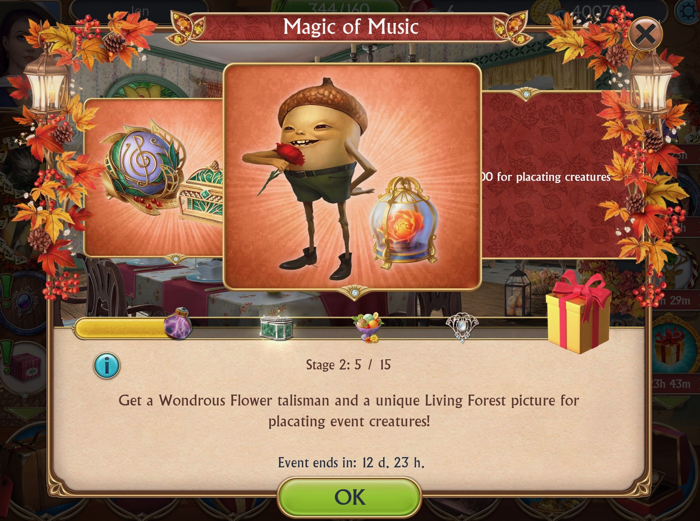 Holiday creatures, like these, require the player to collect items that can only be found by successfully finding all the hidden objects in the Fall House. This baby acorn is a hopeless romantic whose courting causes a lot of trouble. Congratulations! 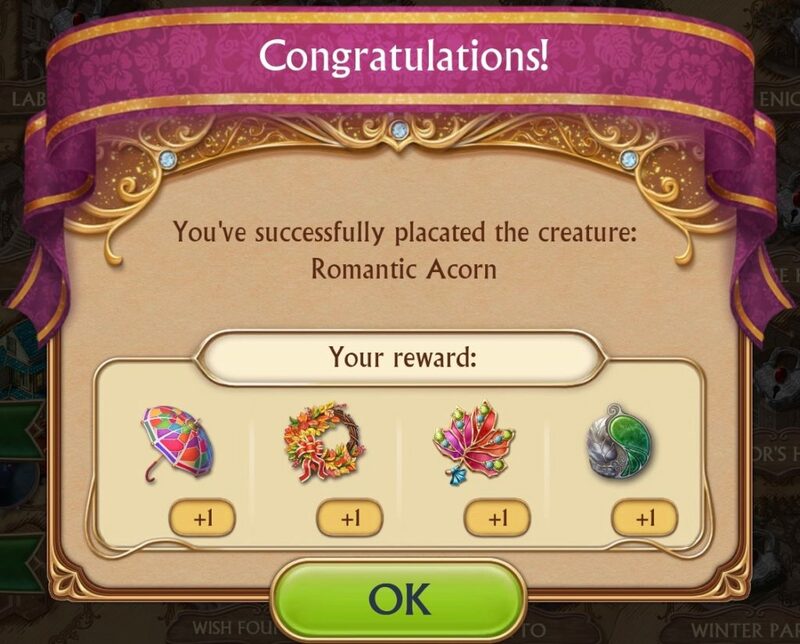 You’ve successfully placated the creature: Romantic Acorn. 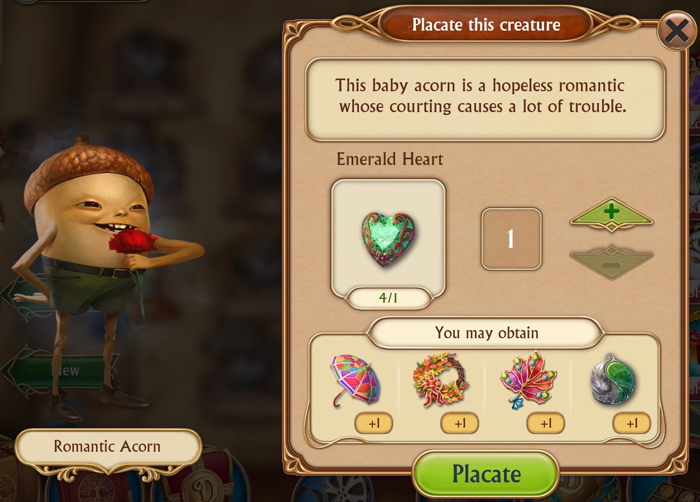 Placating the Romantic Acorn gives the player some items that can be used to placate the next creature in the group. There is a pattern. Placate the first creature twice – and you can placate the second creature once. Placate the second creature twice, and you can placate the third creature once. Colonel Hammerstrike: Great! 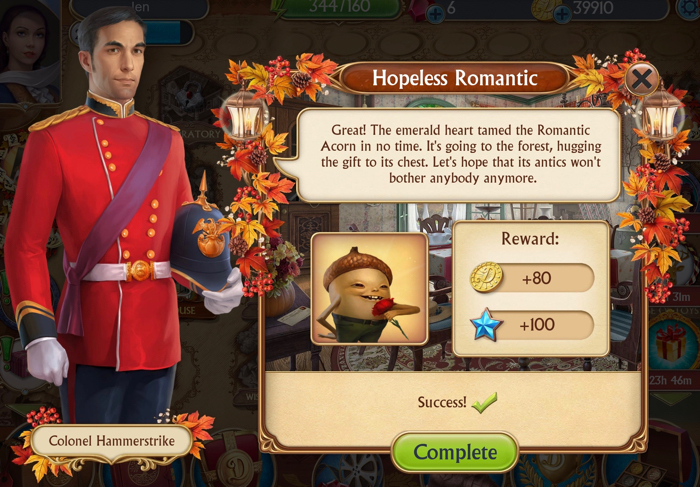 The emerald heart tamed the Romantic Acorn in no time. It’s going to the forest, hugging the gift to its chest. Let’s hope that its antics won’t bother anybody anymore. Colonel Hammerstrike: The townspeople are concerned about the appearance of a forest creature called the Playful Mushroom. It hides in backyards, scares people, and then runs away, laughing loudly. It’s time to put an end to its mischief! A habitual noise maker and peace disturber that knows no moderation in its antics. Congratulations! 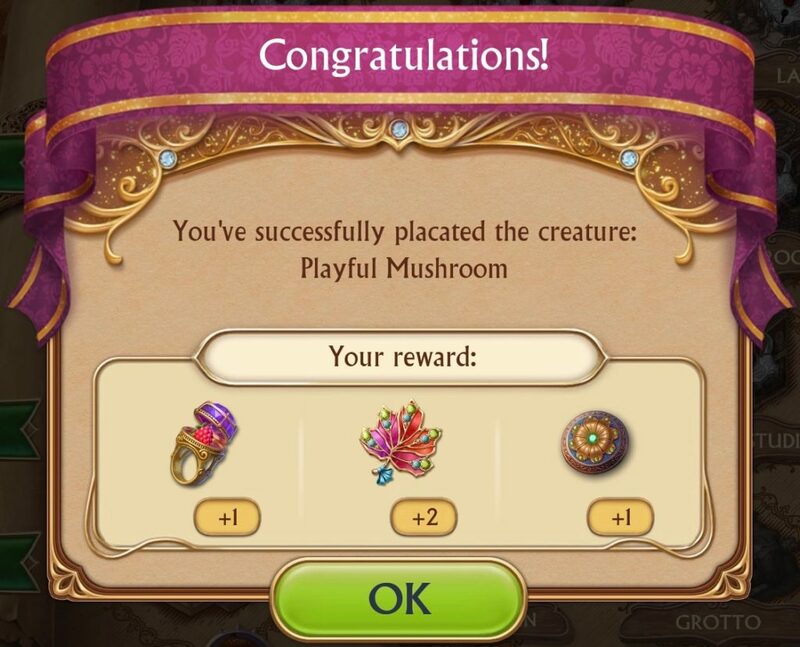 You’ve successfully placated the creature: Playful Mushroom. Colonel Hammerstrike: Unbelievable! 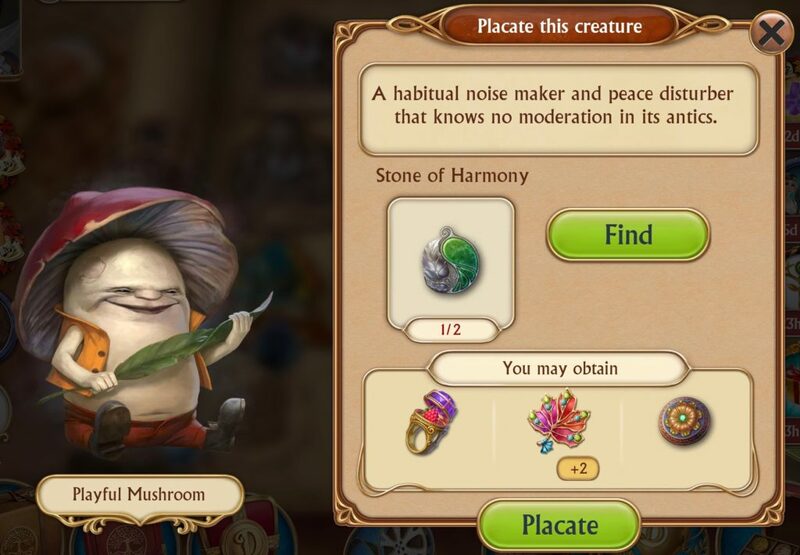 After touching a stone of harmony, the Playful Mushroom has turned into an ordinary mushroom. It must have finally made peace with nature. Colonel Hammerstrike: The city has begun to panic! A giant tree is all to blame; it roams the streets of Darkwood and frightens the townspeople with its long branches and thick roots. Any idea how to deal with it? 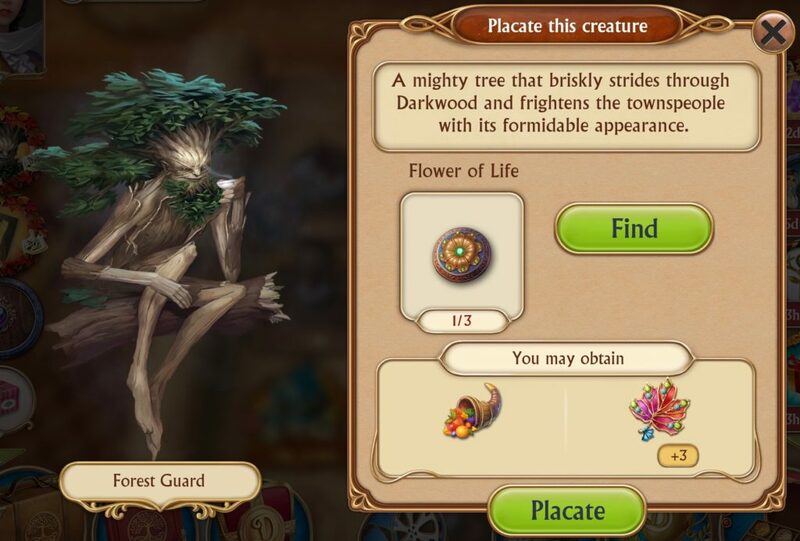 A mighty tree that briskly strides through Darkwood and frightens the townspeople with its formidable appearance. Congratulations! 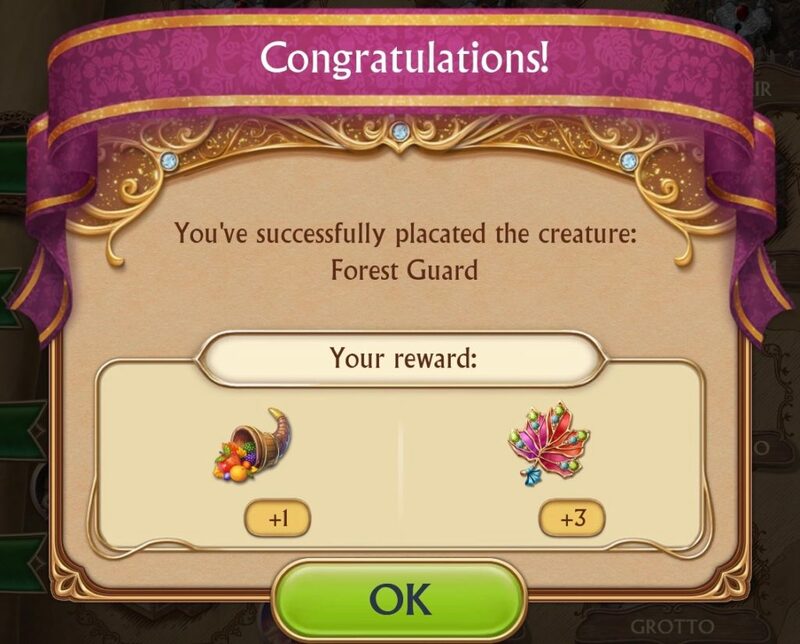 You’ve successfully placated the creature: Forest Guard. 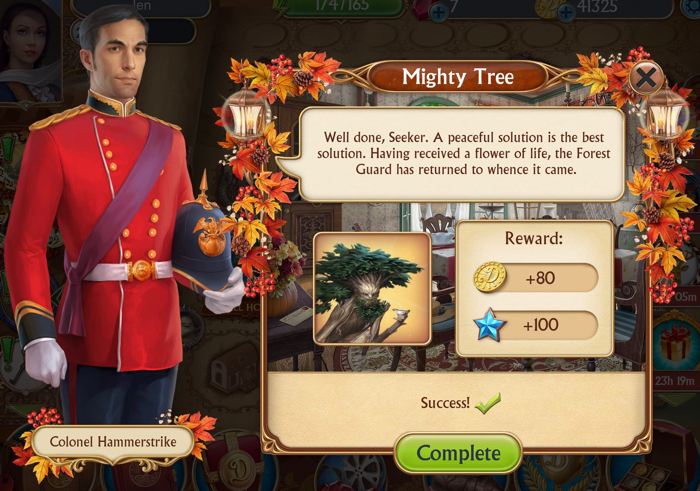 Colonel Hammerstrike: Well done, Seeker. A peaceful solution is the best solution. Having received a flower of life, the Forest Guard has returned to whence it came. As a result of completing this quest chain, I was able to finish State 1 of the part of the Magic of Music event that requires the player to placate the holiday creatures. 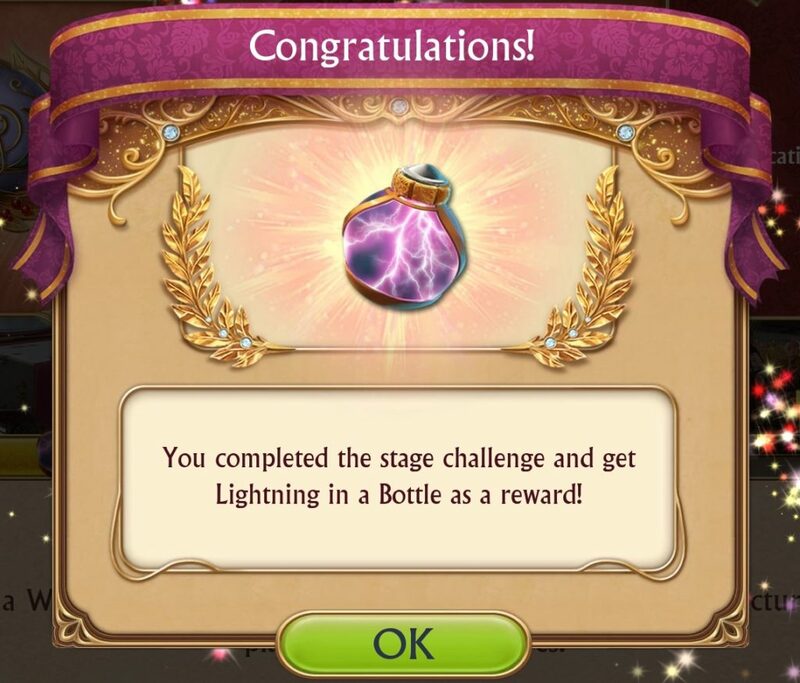 As you can see, I had a lot farther to go before I could receive the special prizes. Congratulations! 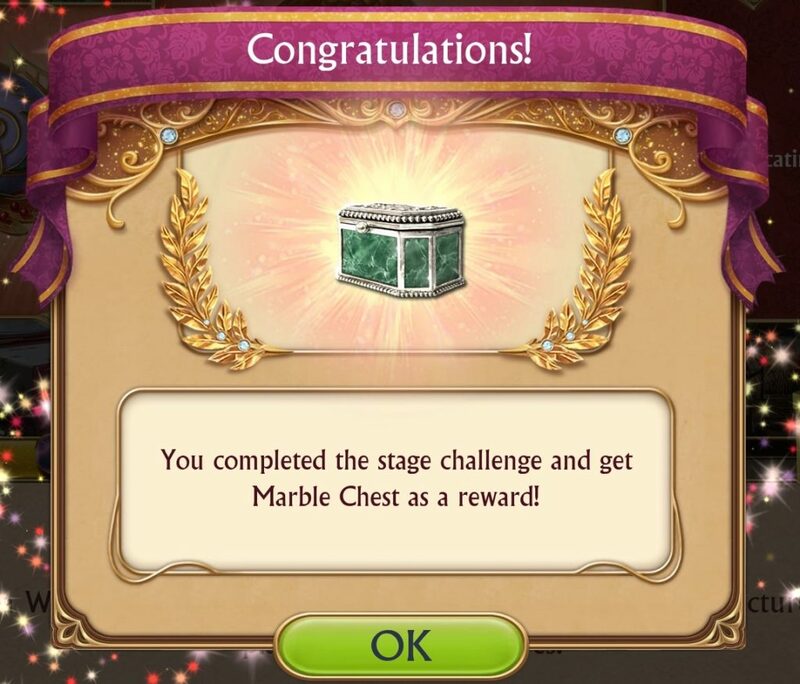 You completed the stage challenge and get Marble Chest as a reward! 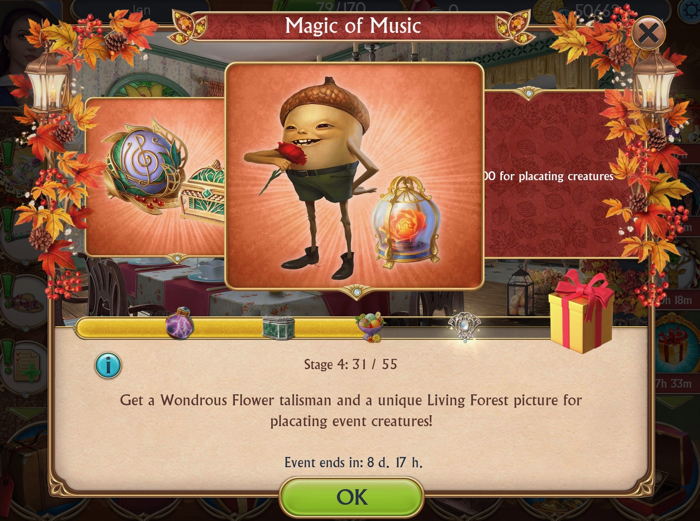 With effort, and after successfully finding all the hidden objects in the Fall House multiple times, I was able to complete up through Stage 3 of the placate holiday creatures part of the Magic of Music Event. At the time I am putting together this blog, there is less than 24 hours left in the Magic of Music event. I’ve managed to complete the placating creatures tasks up to Stage 5. There is not enough time for me to make any more progress. Seekers Notes: Magic of Music Creatures is a post written by Jen Thorpe on Book of Jen and is not allowed to be copied to other sites.